WA: Who Finds You When You Wander Off The Hiking Trail? Kia is a 2 year old German shepherd who is training to be a search and rescue dog with the Yakima County K-9 team. The team is made up of volunteers who search for missing hikers, hunters, children, and senior citizens.credit: Courtney Flatt. RICHLAND, Wash. — If you’re out one day hunting or wander off a hiking trail, a select group of volunteers may come to look for you. K-9 search and rescue teams spend countless hours training for just such an emergency. German shepherd Kia lifts her nose in the air, sniffs, and takes off. Kia is searching Central Washington’s Chamna Natural Preserve for missing hikers. Her handler and owner Gina McNearney isn’t far behind. “Get to work,” McNearney tells Kia. The pair joined the Yakima County K-9 Search and Rescue team about 1.5 years ago. Kia is being trained to become a certified search and rescue dog this spring. Today, Kia and McNearney are looking for two volunteers posing as missing hikers. “You spend as much time doing this, they definitely become like your child, my best friend,” McNearney said. Search and Rescue teams must volunteer at least 30 hours a year, not to mention at=home practice to help the dogs hone their skills. All to come find you when you go missing. Harry Visser is one of today’s volunteer missing hikers. Right now, search and rescue team member Barb Lee helps him hide behind brambles and in between several tree stumps, unseen from the winding path several feet away. “Can you fit in between those to logs right there and sit there?” Lee said. “Because the curve of the branch and everything will help hide you,” Lee said. “Okay. I will get in there,” Visser said. Visser has served as a missing hiker for the Yakima Search and Rescue team several times before. He’s hidden in the Cascades, in canyons, and now in the desert. “I always got a book. Once in awhile it takes them awhile,” Visser said. To find Visser, dog Kia is using a search method known as air scent. Lee said that’s the most common way of looking for a lost person. “The missing hiker, when you send a dog out, they’re just looking for human scent. They’re going to go to whatever they find, and if they find somebody that is not lost, we reward the dog anyway and say, ‘Good job. You did great. And tell them to keep on working,” Lee said. Kia’s nose leads her to several hikers, other dogs, and a tarp with human scent as she searches for Vesser. “Not it. Good girl. Find the next one,” McNearney tells Kia. McNearney said one of the most difficult parts of search and rescue is to not out think your dog. Dogs’ noses are 40 to 100 times more powerful than humans’ -– and they’re usually right when they signal that they smell someone. Like onetime when a volunteer missing hiker was hiding in a tree near a creek, McNearney said. She thought the hiker wasn’t supposed to be in that area. “That was the first place Kia went, right off the bat. But I called her off, which is something that you never want to do. Sure enough at the very end, that’s where she was. I should have trusted her to begin with. But it was a lesson: trust your dog,” McNearney said. About an hour in to this search, Kia finds the brambles where missing hiker Harry Visser is hiding. She makes her way to the two stumps, takes a Rin Tin-Tin pose, and runs back to her handler. “Good job. Show me, Kia,” McNearney said, as Kia signals that she’s found someone by touching McNearney’s hand. a missing volunteer in a suburban neighborhood park. During an actual search, most dogs don’t actually find the missing hiker. That’s because there are so many teams on the ground. Many dogs are actually eliminating search areas for the police — an important task. McNearney said she can’t wait to get her dog Kia certified, so that she can start helping people. “It will be very rewarding, especially to be able to finally go out with her,” McNearney said. McNearney said all the effort put into training will be worth it to help find someone who’s gone missing. Back at the base camp, several handlers head out to do another type of search: one for human remains. For training, the group uses placenta stored in glass jars. Ruth Hanson is the Yakima County team leader. She said the group often gets asked: Why do this type of search? Hanson says the answer is simple: closure. “So even though the lost hunter or hiker or whomever might not be alive anymore, if we can help located that diseased person, then certainly it’s a little easier on the family,” Hanson said. There are five jars placed under cement blocks and wooden stumps, all hidden in a small area. This simulates animal predation, where small bones may have been scattered in an area. “You see her close her mouth? She’s taking a deeper breath,” McClean said. When Minx finds the “stinky,” she whines and sits down, looking over at McClean. McClean confirms she’s found what she’s looking for and rewards Minx with a treat. Once Minx has found all five spots, she is rewarded with a squeaky ball. “We’ve covered the ground pretty well. She seems to be picking up the old scent, so I’m going to call it,” McClean said. In the last type of training for the day, dogs search using a method that’s known as trailing. This is the type of searches you most commonly see on crime dramas like CSI or Law and Order. Dogs take a whiff of an item that belongs to the missing person and follow that trail of scent, eliminating all other human smells as they search. With this type of search dogs are on a leash. It’s often used to find missing children or senior citizens in an urban setting but can be used in the wilderness. Donna Dill takes her German shepherd Tala to search for, once again, Harry Visser. The team jokes about using the same missing hiker multiple times. “When we work with each other a lot, and we get lost a lot, sometimes the dogs give you that look like, ‘Really?’ He’s lost all the time,” said Ruth Hanson. Dill takes Tala to a trail on the reserve that Visser has walked before, so that she can pick up his scent. Tala smells one of Visser’s hats that is kept in a zip locked bag, like evidence. Harry Visser feeds Tala after she finds him. “Where’d he go?” Dill asks Tala, as she takes off on the trail. About 10 minutes later Tala has found Visser hiding behind a boulder, his book in hand. Visser gives Tala some snacks and throws a squeaky ball for her to fetch. “Good girl. You found me,” he said. CORDOVA, Tenn. - A little Tennessee boy who became trapped and hidden from view while walking his dog survived cold temperatures for 14 hours by cuddling with his dog. Dominic Jeffries, 7, was walking his dog Coco in his front yard when she pulled him from the home and eventually they both slipped behind a cement retainer wall that was covered in brush. Unable to climb out Dominic had wait in the cold until help could arrive. Dominic remained stuck behind the retainer wall during a cold night in Cordova, Tenn., wearing a camouflage jacket and large fur hat. His legal guardian Robbyne Manning said that they searched the area near where Dominic was stuck many times. but never saw him behind the leaves. While Dominic heard his name and saw police lights he didn’t respond. Dominic was only a few blocks from home, but he was missing for approximately 14 hours during a cold night when the temperature dipped below freezing. Manning said to keep warm, Dominic started to hug Coco, a black Shih Tzu. However as the night wore on, the dog started to get cold and Dominic took off his jacket to warm up the dog. Eventually worried that the dog would get too cold, Dominic took off her leash so that she would hopefully go home and get help. For another three hours Dominic stayed in the cold by himself. When his shoes and socks became wet, he took them off and put his gloves on his feet. Eventually as daylight broke, a police officer spotted Dominic. Josephine County: All in a K9's day of training! In order to prepare for call-outs, we need to train in all kinds of weather and situations. Today I met with Monica McFadden and Rain Redfield at the end of Messinger Road where we have access to the backside of Pacifica, giving us over 100 acres to search for our 'missing' subjects. Monica and I give Rain two thumbs up for his willingness to dress in a ghillie suit for his first time out volunteering to help us set up a special problem to help our dogs locate and recognize a missing hunter. I gave Rain a radio with a description of the general area I wanted him to 'disappear' in, and off he hiked into the woods, packing a poncho and lounge lizard to give some insulation from the damp ground as the rain dripped off the bill of our caps. While waiting for him to let us know he'd found a place to hunker down, Monica and I readied our GPS units, and dog tracking collars, discussing our expectations for the day and what kind of behavior we might see in our dogs finding Rain, but not actually seeing him. Rain radioed that he was in place. I made sure I had Cody's (my Golden Retriever) rewards in my pack, then dressed Cody in his search vest, buckled on his tracking collar, and watched Monica head for cover as I led Cody to our start point. I climbed over a green metal gate as Cody ducked through barb-wire. I let Rain know we were coming, and gave Cody his command. Watching my dog run, leaping fallen logs, nose in the wind never grows old. The sheer joy on his face is infectious and I'm eager to 'dance' with him, directing him through the woods with my body language or a wave of my hand. He runs huge circles with me in the loop, glancing my way as he passes. When Cody stops, head and tail up, nose working the breeze, I wait as he processes the information. He's repeated this in the same direction twice now, so I encourage him to check it out, and move in that direction to the north. Cody leaps a huge log, and he's gone out of sight. I follow quickly in the direction he ran, then wait, listening for his bell. He's too far away to hear it. Then a flash of orange through the mix of conifers and oaks, it's Cody's search vest, he's returning to me. He runs straight for me and leaps, tackling my legs, which is his alert. "Show me," I command, and he runs ahead of me. It's hard for me to keep him in sight, but then his tail starts wagging furiously and I know he's brought me to Rain. It takes several seconds for my eyes to adjust, to pick out the mossy outline of Rain tucked under cedar boughs. If not for Cody, I would've walked right on by. I give Cody his rewards, and find out from Rain that Cody nosed him a bit but had no problem coming in to him. We walk out together to another area, where I give Rain some parameters for him to hide for Mara, Monica's Golden Retriever, and turn to walk the dirt road back to where we parked. The rain is pelting harder now, and my legs are damp, as Cody and I prolong his reward game. Monica gets the call from Rain, and it's her turn with Mara, the Golden eagerly tugging on the leash to have her special hunt with 'Mom.' And after Mara, Rain was happy to wander out in the woods again, for Dingle. Each training is special. We love what we do, love our dogs, and so appreciate all the help from the special SAR people, like Rain, in order to some day rescue someone special who needs us. Marian Beland of Somersville, Conn., and her cadaver dog, a Portuguese water dog named Tracer, search Tuesday for additional grave sites at the former Dozier School for Boys. Researchers from the University of South Florida enlisted teams of cadaver dogs to help in their search. ASHLAND, Va. (WTVR) — A desperate search for a search and rescue group’s missing rescue hound in Hanover County has a happy ending. Officials from Hanover Hounds K9 Search and Rescue said one-year-old Scoobie jumped a six-foot fence and got away Wednesday. The group posted on its Facebook page that the Black and Tan bloodhound disappeared in the Slash Cottage area of Ashland behind Luck Chevrolet off Route 1. “Please share this so everyone in this area can be on the lookout for Scoobie… We need to get her home safely,” read a post on the group’s Facebook page. WTVR.com posted the story Thursday afternoon and asked our Facebook and Twitter followers to help spread the word. And within a few hours, there was good news to report. “Because of your promptness with putting the story on your web page, we received a call from a lady named Lisa who thought… she had seen Scoobie,” Teresa Parrish with Hanover Hounds Search and Rescue told CBS 6 News. Parish said the woman thought she had seen Scoobie behind the Howard Johnson’s near a truck stop running the fence line around 7 a.m.
Parish immediately contacted her team and they headed to where the woman said she had seen the dog. Then Lisa called around 5:30 p.m. to report she had seen the hound once more. Lisa reported that she knew it was Scoobie, but that the dog has run back into the woods. Parish then instructed the woman to knell down and call Scoobie softly. Once another team member arrived, the dog ran back into the woods. However, once they went into the woods and called the dog, Scoobie ran up to him. “Because of you our team member was brought back to us and a family was reunited… Now she can continue her training to find and save lives because of your and Lisa’s help,” Parish wrote. The organization’s mission is to provide Hanover County and the Commonwealth with K-9 search crews to find lost and missing people. Those services are available to law enforcement and Fire/EMS at no cost. A sincere thank you to all of our friends on Twitter and Facebook who helped spread the word about this story. 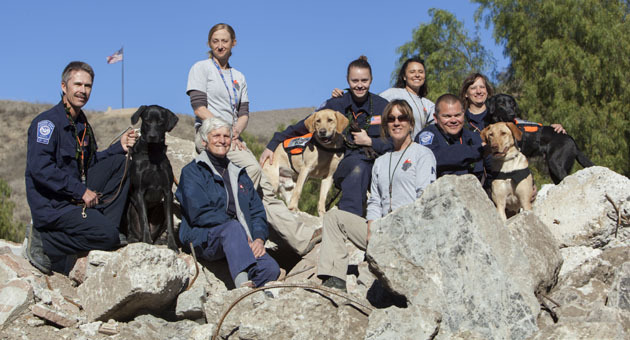 The Ojai-based National Search Dog Foundation prepares the canines to come to the aid of disaster survivors. After training for nearly a year on how to find disaster survivors, four dogs ran to greet their new owners earlier this month and were greeted by smiles and even some tears. The National Search Dog Foundation, based in Ojai, works to train shelter dogs to respond in the most dire of situations and to save lives. First responders come from all over the country to train and to be paired with trained dogs that will live with them and be deployed to disasters as they happen. Dogs from the NSDF have been deployed to disaster areas including those affected by the Sept. 11, 2001, terrorist attacks, Hurricane Katrina and the Haiti earthquake, where they are trained to help their first-responder owners find survivors. Earlier this month, four Utah firefighters were paired with dogs that had been training for almost a year at the organization's National Training Center in Santa Paula. Click here to watch the videos of the owners meeting their dogs for the first time. Cole, Decker, Tanner and Taylor had been in training for the better part of 2013 and were paired with first responders Roxanne Bauman, Tracy Christensen, Trevor Lawrence and Maddie Warner. The first responders had been attending task force trainings for several months in preparation for the two-week handlers course at the training center. First responders contact the group and are trained by the organization. "There are other people who sell search dogs," Janet Reineck of the NSDF toldNoozhawk on Monday. "We get rescue dogs and we give them away, and the program is ongoing training." For the dogs, it's a particularly difficult assignment to be deployed to a disaster area. That's because unlike a bomb or drug dog, these dogs are off-leash during their assignments, and have to be directed by their owners from far away with hand signals or whistles, Reineck said. While a drug sniffing dog can be trained, search dogs can take up 10 months to train. "It is a needle in a haystack to find these dogs," she said. The dogs also must have intense focus — if they find someone buried alive, they must stay with that person until the first responder comes to that person's aid. "It's victim loyalty; once they find something, nothing will tear them away," she said. "They can't have any distractions." They are FEMA test certified, which Reineck compared to passing the bar. Dogs have to find several victims in a large field of rubble and if they "false alert" — i.e., stop and explore a planted scent of chicken, food or even a cadaver scent — they are disqualified. The trainers are working to match the dogs with first responders, who will own the dogs for the rest of their lives. "The dog is with you all the time," she said. "You don't play with this dog, you play with a meaning." To find out more about the organization or donate, visit their website by clicking here. GROVERTOWN, Ind. – K-9’s from Michigan’s Search and Rescue took to the snowy fields of Grovertown where Isaiah Grounds was last seen. It is Pam Burns’, President of Michigan Search and Rescue, dog, Andor, who does a lot of the work. “Our mission is to find missing people and recover the deceased,” says Burns. Dogs like Andor are trained to find human remains. “Hopefully today they find nothing,” says Oscar Cowen, Sheriff of Starke County. Grounds has been missing for almost two weeks, he disappeared after his car was found late on night full of blood. The Starke County Sheriff’s Department has been searching, but they are asking for help now too from Michigan’s Cass County and it’s K-9 Team. Nellie, a one-year old bloodhound, is ranked among the nation’s best search and rescue dogs. “We have a bloodhound out here that would track the scent of the area where we believe Isaiah might have walked,” says Cowen. Grounds’ sister stood close by as the dogs and investigators did their work, waiting for any word of her missing brother. The Starke County Sheriff’s Department confirmed with ABC 57 News that the bloodhound did trace Grounds’ steps from the scene of the accident to his home a few blocks away. They say it leads him to believe that Grounds is alive and in hiding. Warren filmmaker Mary Healey Jamiel has witnessed a lot over the past three years. She has seen state police dogs recover suicide victims from the Sakonnet River. She’s seen them track down missing persons, solve decades-old cases and even seen the dogs rescued from near death themselves. But nothing has been as powerful as the bond she’s seen form between the dogs and their handlers. That relationship is the crux of “Reliance,” a 90-minute documentary she is close to completing which tells the story of the Rhode Island State Police’s search and rescue dog team, led by Sgt. Matthew Zarrella. Ms. Healey Jamiel, an associate professor of communication studies and film/media at the University of Rhode Island, spent three years with Sgt. Zarrella, who trains former pound dogs for search and rescue missions. She traveled across Rhode Island extensively and went as far as Maryland and Maine filming the officer and his faithful companions. In the process, she entered a world that few know much about and fewer still understand. Going in, “this whole world was completely foreign to me,” she said. But “I was very interested. Dogs seem to do something to the human brain. They make us feel good, and I think they calm us. And I also was very inspired watching search and rescue workers with their dogs after 9/11.” The story, she said, honors the incredibly tight bond that forms between the dogs and their handlers. Though filming finished earlier this year, she’s been busy continuing work on the project. Going through the footage is one of the most time-consuming parts, as she has 64 terabytes of video data on her computer to go through. She is also working with animators to help illustrate the tight bond she witnessed between dog and handlers. Last week, she appeared on the “Today” show with Sgt. Zarrella to talk about the film. In the midst of it all, Ms. Healey Jamiel has started a ‘Kickstarter’ campaign help her raise $70,000 to complete post-production on the 90-minute documentary. Though she has received several grants from the Rhode Island State Council on the Arts, the additional funds are needed to finish the project, and she hopes to raise the money by early January. So far, sponsors have donated about $37,000, and those who donate can receive rewards, including clothing and even their name on the credits. If she doesn’t raise the money by the end of her campaign, the funds will be returned. Ms. Jamiel’s previous films have included films on Lyme Disease and global climate change, and she won awards for her 2005 film “Holy Water-Gate,” which examined decades-long sexual abuse scandals within the Catholic church. She hopes to market “Reliance” internationally, and hopes to launch it at film festivals and screenings across North America and the UK, Australia, Europe and Korea. If all goes well, post-production will be complete in a year, with the film being released in 2015. When U.S. President Barack Obama went to Fort Campbell, Kentucky earlier for a highly publicized, but very private meeting with the commando team that killed Osama bin Laden, only one of the 81 members of the super-secret SEAL DevGru unit was identified by name: Cairo, the war dog. Cairo, like most canine members of the elite U.S. Navy SEALs, is a Belgian Malinois. The Malinois breed is similar to German shepherds but smaller and more compact, with an adult male weighing in the 30-kilo range. Like their human counterparts, the dog SEALs are highly trained, highly skilled, highly motivated special ops experts, able to perform extraordinary military missions by Sea, Air and Land (thus the acronym). The dogs carry out a wide range of specialized duties for the military teams to which they are attached: With a sense of smell 40 times greater than a human’s, the dogs are trained to detect and identify both explosive material and hostile or hiding humans. The dogs are twice as fast as a fit human, so anyone trying to escape is not likely to outrun Cairo or his buddies. The dogs, equipped with video cameras, also enter certain danger zones first, allowing their handlers to see what’s ahead before humans follow. 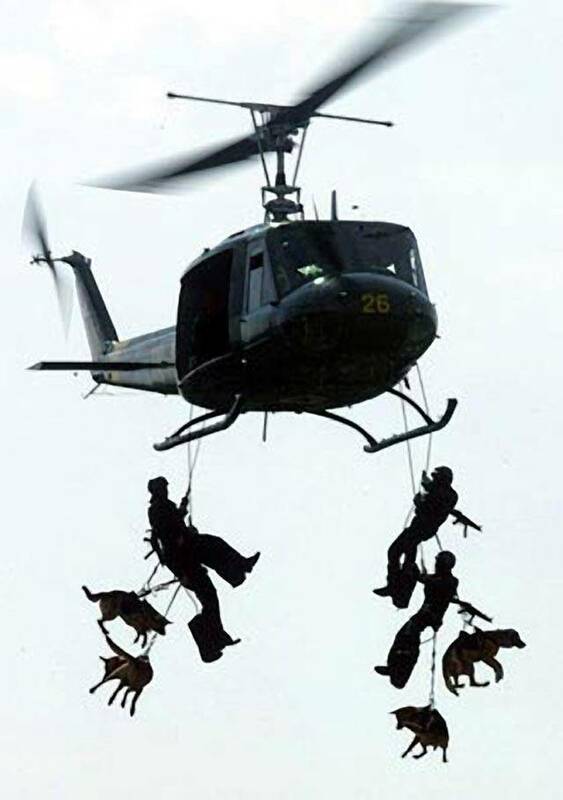 As I mentioned before, SEAL dogs are even trained parachutists, jumping either in tandem with their handlers or solo, if the jump is into water. 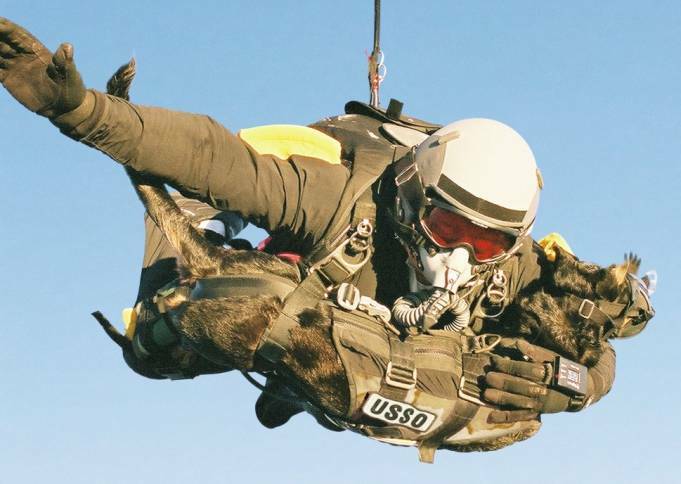 Last year canine parachute instructor Mike Forsythe and his dog Cara set the world record for highest man-dog parachute deployment, jumping from more than 30,100 feet up – the altitude transoceanic passenger jets fly at. Both Forsythe and Cara were wearing oxygen masks and skin protectors for the jump. Here’s a photo from that jump, taken by Andy Anderson for K9 Storm Inc. (more about those folks shortly). As well, the dogs are faithful, fearless and ferocious – incredibly frightening and efficient attackers. When the SEAL DevGru team (usually known by its old designation, Team 6) hit bin Laden’s Pakistan compound on May 2, Cairo ‘s feet would have been four of the first on the ground. And like the human SEALs, Cairo was wearing super-strong, flexible body Armour and outfitted with high-tech equipment that included “doggles” – specially designed and fitted dog goggles with night-vision and infrared capability that would even allow Cairo to see human heat forms through concrete walls. Now where on earth would anyone get that kind of incredibly niche hi-tech doggie gear? From Winnipeg, of all places. Jim and Glori Slater’s Manitoba hi-tech mom-and-pop business, K9 Storm Inc., has a deserved worldwide reputation for designing and manufacturing probably the best body Armour available for police and military dogs. Working dogs in 15 countries around the world are currently protected by their K9 Storm body Armour. Jim Slater was a canine handler on the Winnipeg Police Force when he crafted a Kevlar protective jacket for his own dog, Olaf, in the mid-1990s. Soon Slater was making body Armour for other cop dogs, then the Canadian military and soon the world. 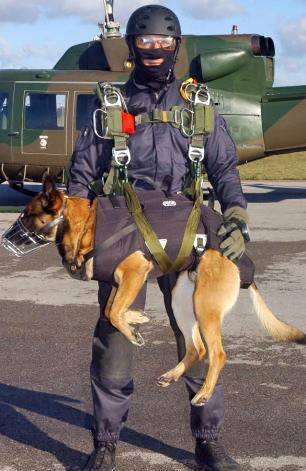 The standard K9 Storm vest also has a load-bearing harness system that makes it ideal for tandem rappelling and parachuting. Just as the Navy SEALS and other elite special forces are the sharp point of the American military machine, so too are their dogs at the top of a canine military hierarchy. In all, the U.S. military currently has about 2,800 active-duty dogs deployed around the world, with roughly 600 now in Afghanistan and Iraq. Several of the photos I have included here are from Foreign Policy, as you will see. Other photos are from K9 Storm Inc.
As for the ethics of sending dogs to war, that’s pretty much a moot point, don’t you think? If it’s ethical to send humans into combat, then why not dogs? The U.S. now treats its war dogs as full members of the military. Tonight was our search and rescue volunteer appreciation dinner, and to my great surprise, I recieved this beautiful plaque honoring Jasper, who died this past spring. They had actually had it made as a retirement honor months ago, but he passed so soon after he retired, that they decided to wait until a better time. One of the Sheriff's deputies penned the lovely poem and Aaron supplied the photos. I am truly, truly touched by such a amazing tribute to my amazing dog.